Ok, so you donât exactly need to be a rocket scientist to see that this dude has some serious issues. 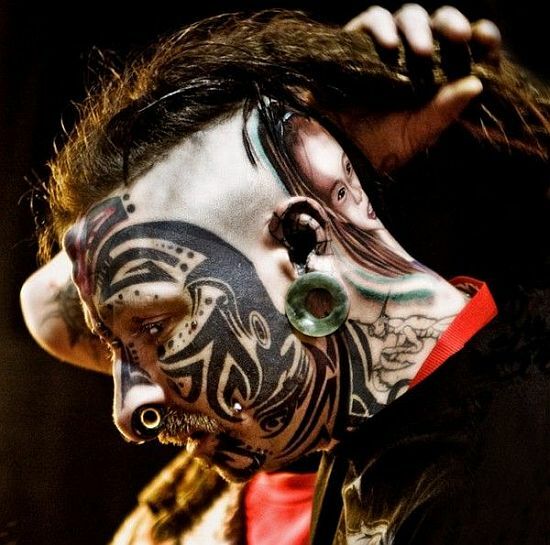 Which makes us wonder why he decided to get his entire face covered with this strange mix of tribal/alien crop circle tattoos and piercing that not only look painful but also quite pointless to be honest. I can make out a few patterns that can offer some explanation for this rather bizarre choice of body art, like the tattoo of a little girlâs face on the back of the manâs shaven head which means he has some problems with his child (custody issues? ), though I certainly think that the mythical creature with lobster clamps in place of hands can also mean that he has done something terrible in the past, which he feels very guilty about and now, he wants to make amendments and treat that issue or person with the utmost sensitivity! Or maybe he wants to chop off somebodyâs head and enjoy the fragrance of fresh blood gurgling out of that personâs body with the freaky nostril-widening ring-thingy enhancing his sense of smell! Geezâ¦ I gotta stop watching those freakin’ Dr. Phil DVDs my cousins keep sending me from the States. This psychology deciphering thing is driving me nuts! ← Hello Kitty Tattoo on forehead; yeah WTF!